We left the WaKeeney KOA on Tuesday morning and headed for Denver traveling I-70 to Limon, CO where we took CO-86 over to Castle Rock. Except for some rough road patches on CO-86, I enjoyed the back road and we got to see some real SE Colorado ranch country. 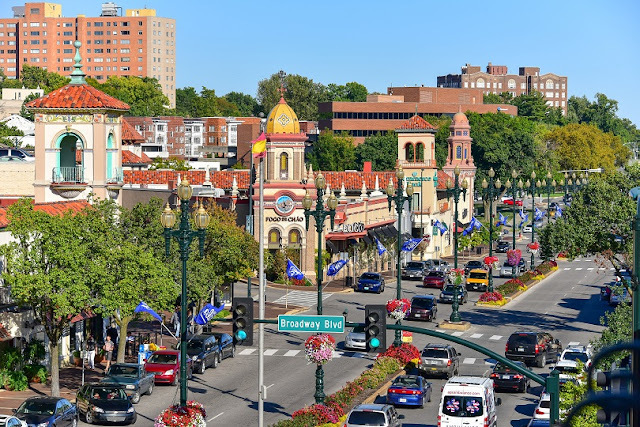 On Sunday, we drove around downtown KC, for the first time, to get a sense of it then headed south a few miles to the Country Club Plaza area for some shopping and a BBQ fix for Bev. While the down town area was pretty void of people, I discovered why when we got to the plaza as it was very crowded. 2016 Western Trip – Days 3&4 – Columbia and Kansas City, MO. After I published my last post, we had an unexpected event at Duck Creek RV Park – a transformer failed and shut down power to the campground about 7:30pm, shortly followed by the start-up of a lot of generators to keep the AC’s running as it was still in the mid-90’s. The power company had it fixed about 10:30 and the silver lining is that it happened late in the day when the sun was setting and temps were going down. We left Paducah about 9:15 am and headed for Columbia, MO for an overnight stop at CottonwoodsRV Park. The trip was uneventful, the roads were all decent and traffic in the St. Louis area was heavy as expected – all-in-all a pretty good day. Cottonwoods is about 25 years old and built before the 45’ coaches of today so it is pretty tight getting in and out but we did make it with me driving and all three of the girls watching potential problem areas. Our first day got underway at a respectable 9:15am and we headed west on I-40 to Nashville, then west on I-24 to Paducah, KY. There were four of us on the first part of the trip – Bev, Pat, and me, of course, and we were joined by granddaughter Riley for the first two weeks – at 14, she is Madison’s youngest sister. It was a 310 mile trip to Paducah for a two night stay in Duck Creek RV Park located southeast of town. The park is conveniently located about a half mile north of I-24 on KY-1954 and it’s about 10 minutes from downtown and a couple of minutes from Walmart and other shopping needs. After a fun week each with two of our kids, Sweetie has been repaired and serviced, and Cindy has moved in to look after things, so we are now ready to hit the road for a little while. Basically our plan is to head for the high country of Colorado to beat the heat but it will have to change some to deliver the lower temps we are hoping for - may have to do Montana next year. Our travel plan begins with spending seven days getting to Denver and staying there for six full days touring around the area and visiting with friends. From there we will head across the mountains for a week in Grand Junction as the girls liked it during our last visit and wanted some more time there – we are expecting hot in Denver and GJ so we’ll head up onto the Grand Mesa for cool. From Grand Junction we will go south to Montrose for 10 days from which we will visit Silverton, Ouray, Telluride, the black Canyon and other points of interest. Then it will be on to Gunnison for 10 days for visits to Crested Butte, Lake City and the surrounding mountain areas. Next up is 10 days in Buena Vista, where we spent a few days once before, from which we’ll go to Salida, Aspen, Leadville and perhaps the Royal Gorge. Finally, we’ll leave CO and head down to Santa Fe, NM for a week to check out what the city has to offer plus visiting Los Alamos and areas north of town – eg. Taos. From Santa Fe, we’ll take about a week to get home and start getting our place ready for winter. If you’ve visited these areas, we would really appreciate your advice on places to go, things to do, places to eat, and anything else you think we should know. Velva hit the nail on the head and when I re-enabled third party cookies, it fixed the problem - Thank you so very much and thanks to all who responded. I mentioned on a previous post that I was having trouble commenting on some blogs and I still don’t know how to fix it so any help would be appreciated. If you will look at: http://highlandsranchfoodie.com/2016/07/green-chile-chicken-burgers/#.V3vDfvkrKM8 – I can comment on these whether or not I have to add my name, email, etc or it fills itself in. Now look at: https://www.blogger.com/comment.g?blogID=8986801201760240722&postID=5105019422217099295 – It fills in the identity and I can comment on these, also the ones that bring up a small comment box. Now for the ones I can’t comment on, please go to: http://bigdaddydavesbitsandpieces.blogspot.com/2016/07/fat-edds-metropolis-illinois.html#comment-form – these are the ones with the issue and even though I select Google account, it doesn’t take my comment. Most of these are Blogspot but some are not. Before we cleaned up my computer, I believe my profile was already filled in. Also, previously when I was on my home page, in the upper right hand corner, it had four tabs – Create Blog, New Post, Design, and Sign In and now it just has the first and last one – so this is telling me something but I don’t know what. We belong to a small six couple wine club that is really just a social group that uses wine as an excuse to get together to eat, drink, and visit – a description of the wine being presented for tasting is often just reading what is written on the back bottle label, so not exactly wine snobs. 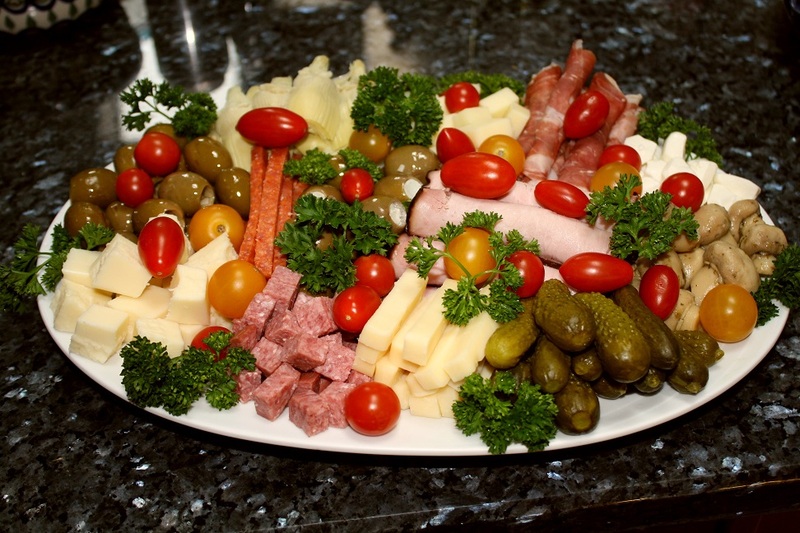 The most recent get together was Italian night with the hosts providing the main course of lasagna and the rest of us providing the other dishes – appetizer, salad, desserts. Our contribution to the meal was antipasto and while not Italian, I have a definite idea of what one is supposed to look like. You know how it is with intentions, we usually have the best of them and so it was with a recent trip to the store. Daughter, Kathy, and I were in the store to pick up a few items from a list but she kept walking around picking up items and saying “my girls love this.” One of these items was a bunch of bananas and to my knowledge they were never touched at home and were soon in a need-to-be-used state. 1. Preheat the oven to 350°F. Lightly grease two 3 1/4" x 5 3/4" mini loaf pans, or one 9" x 5" loaf pan (Bev made ? ?” muffins). 2. Combine the flour, baking soda, salt, and cocoa. 3. In a separate bowl, beat the butter and sugar until light and creamy. 4. Beat in the egg, then stir in the vanilla, banana, and sour cream. 5. Gently mix in the dry ingredients and chocolate chips until well incorporated. 6. 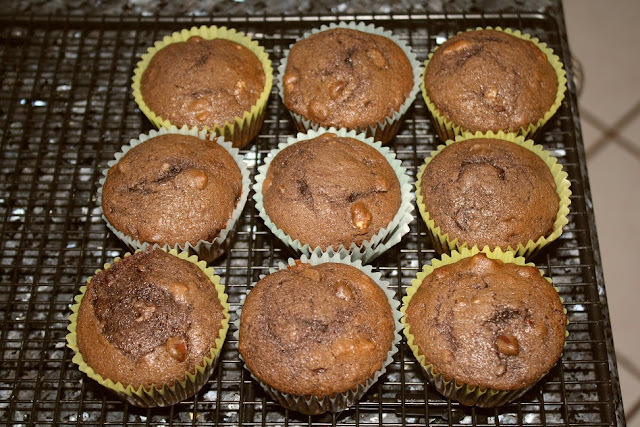 Pour the batter into the pan(s) and bake for 45 to 60 minutes (bake for the shorter time for two mini loaves or muffins and the longer time for the larger loaf), until a cake tester or toothpick inserted into the center comes out clean. 7. Remove the bread(s) from the oven, and allow to rest in the pan(s) for 10 minutes then turn out onto a rack to cool completely.